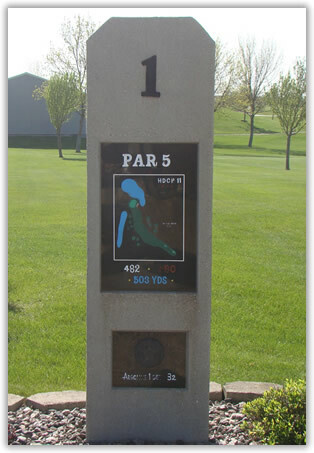 Hole #1 is the shortest par 5 on the course and a good opportunity to start your round off with a birdie. The tee shot provides a wide fairway with a little room for error. The right side has a few small trees, but if you miss too far to the right you risk going out of bounds. If you cannot reach the green in two you must be aware of the pond on the left side on your second shot. Anything that is missed to the left can funnel down into the water. The green can provide a dangerous approach shot, as any shot missed to the right or to the back of the green can end up in the water. The green is long and relatively big and slopes towards the water. 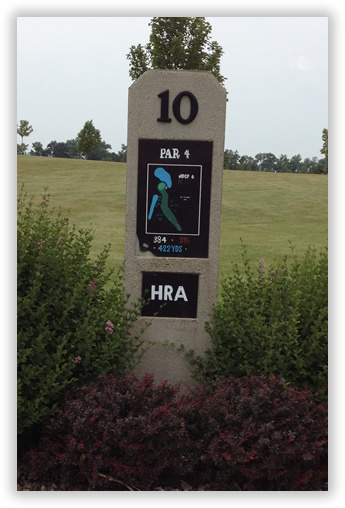 Hole #10 has the same fairway and green as hole number one. The tee shot is a little more difficult with the water being reachable if you miss left. There is still out of bounds off to the right, but if you are able to hit it far enough you can go past the out of bounds. You will want to aim your tee shot straight down the fairway or over the hills on the right side where the fairway starts to dogleg right.